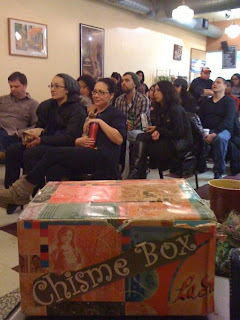 If you didn’t get a chance to come to Proyecto Latina this past Monday here is a visual snippet of a hilarious evening with our feature Ruth Guerra. 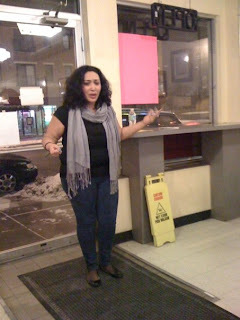 She brought us everything from stories about the tooth fairy to blind dates. My acupuncturist says that my uterus is angry because I have not had a baby yet. I think my uterus is being a little unfair. 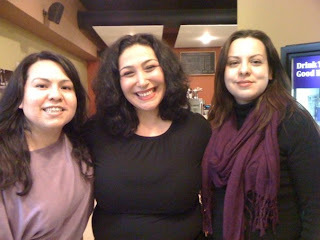 Ruth Guerra is all smiles with Irasema Gonzalez (left) and myself at Cedahlia’s Café. If you have suggestions for features you would like to see us present we’d love to hear from you.